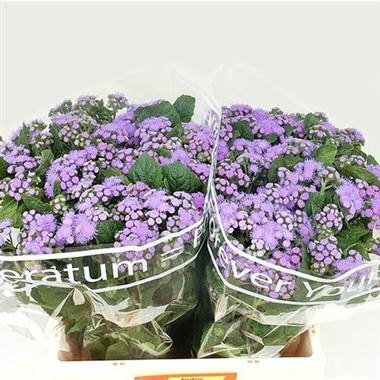 Ageratum is a very pretty lilac/purple cut flower with multiple 'fluffy' blooms at the top of foliage covered stems. Approx. 50cm tall & wholesaled in 50 stem wraps. Ageratum, (also known as Floss Flower & Whiteweed), is a genus of the Asteraceae family and is native to Mexico.